Thank you to Wesley Homes for sharing their video of the crane going up on their exciting senior housing project in Des Moines! We are excited to be partnering with them on their New Gardens building. Northwest Housing Alternatives’ Headquarters Building to Net Zero Certification! We are so excited to be working with MWA Architects and Northwest Housing Alternatives on their new headquarters and affordable housing campus! Josh Kulla from the Daily Journal of Commerce took some great pictures and wrote an article about this exciting project! Northwest Housing Alternatives’ standard practice is to adhere to Earth Advantage standards for all of its new projects. The development and management of their new headquarters is actually being built to achieve net zero certification! Thank you so much to all the WALSH and RDF employees who participated in Movember! Thank you so much to all the WALSH and RDF employees who participated in Movember! Sport a Mo, Save a Bro! Significant thanks to our own Wendy Kato for her dedication and commitment to such a worthy cause! And thanks to The Night Owl Bakery Seattle for the wonderful mustache cookies! WALSH supports Movember, an annual event involving the growing of facial hair and moustaches during the month of November to raise awareness of men’s health issues, such as prostate cancer, testicular cancer, and men’s suicide. Sky Lakes Collaborative Health Center – On Time and Under Budget! 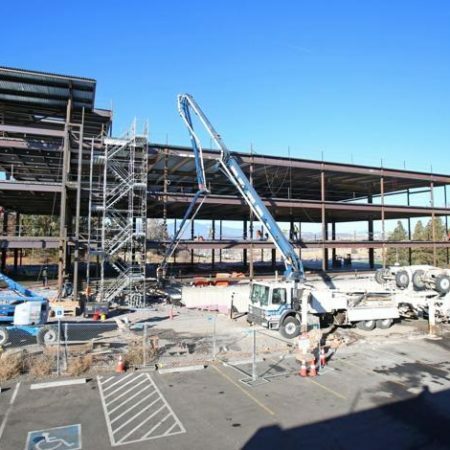 Excellent article in the Herald and News – Klamath Falls, Ore. about The Sky Lakes Collaborative Health Center, the second largest construction project ever in Klamath Falls, Oregon! The center’s construction is a partnership between Sky Lakes Medical Center, a non-profit, community-owned hospital that serves Klamath and Lake counties and Oregon Health & Science University (OHSU), Oregon’s only academic health center. The nearly $50m, 100,000 SF medical office and educational building will improve clinical care, provide an ideal venue for training for OHSU medical students and ultimately enhance the health of the community overall. 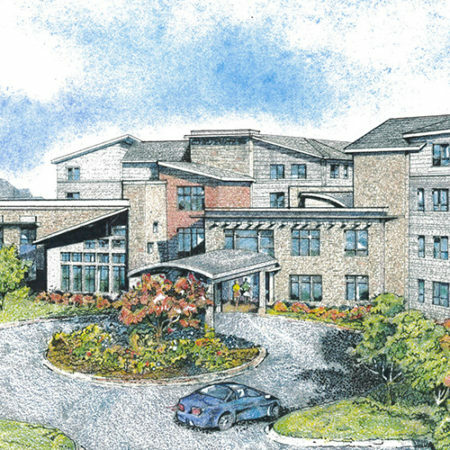 The four-story medical building will bring several providers together under the same roof and will also support the OHSU Campus for Rural Health. By consolidating several Sky Lakes primary care clinics, the building will bring more than three-fourths of the primary care physicians in Klamath Falls under one roof to better serve patients and foster a culture of collaboration among all health care providers. Right now, crews are gearing up to lay out concrete for the first few floors, in addition to mechanical and electrical work inside the building. A huge thank you to our WALSH team of Beverly Culp, Chuck Moore, John Hardesty, Mark Barrows, Mike Sloop, Pete Bruns and Sara Schubert! 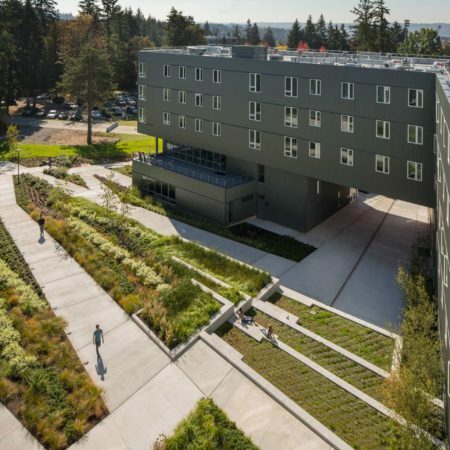 Bellevue College Student Housing received a 2018 Distinguished Project Award from Northwest Construction Consumer Council! Over the past year and a half, NAC Architecture and Walsh Construction Co. have worked closely with the Washington State Department of Enterprise Services, Bellevue College, the City of Bellevue and our subcontractor teams to plan and deliver the College’s first student housing project, achieving LEED for Homes Platinum certification. This project represents the evolution of Bellevue College from a commuter-oriented culture to a 24/7 live/learn residential campus. Unique features include dramatic double-cantilevered building overhangs, public roof decks featuring million-dollar views, student-funded rain gardens, and 10,000 SF of ground floor public space featuring a café, lounge and study areas. Many thanks to: RDF Builders, Co. (Metals, WRB, Finish Carpentry); Architectural Sheet Metal, Inc.; PSA, LLC; Janes Gypsum Floors, Inc.; Bayshore Concrete LLC; SS Landscape; and PELLCO Construction. Congratulations to the dedicated project partners and our talented WALSH team: Mariah David, Tyler Katzen, Blake Flury, Fik Mulugeta, Karen Moon, Brian Lenz, Shannon Morey and John Gilson – impressive work all! 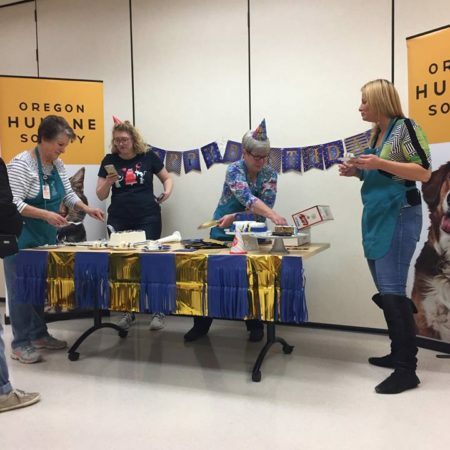 Congratulations to Oregon Humane Society for 150 years! We had a great time celebrating with Oregon Humane Society over the weekend at their 150th Anniversary! Thank you for all the work you do for Oregon’s animals. Arbora Court Receives Affordable Housing Development of the Year by NAIOP! We are delighted to announce Arbora Court was named Affordable Housing Development of the Year at NAIOP’s 2018 Night of the Stars! 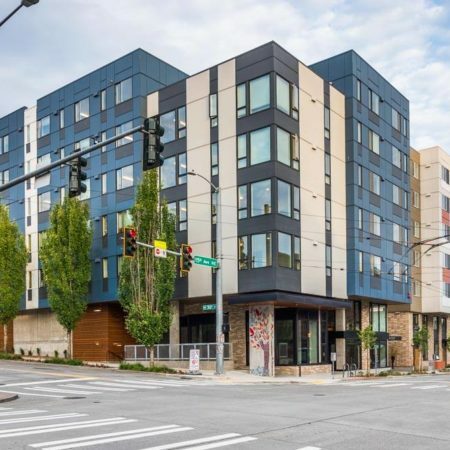 The project, a partnership of Bellwether Housing and University Christian Church, designed by Weber Thompson, has the honor of being the first recipient of the new formed award. Arbora Court is focused on families transitioning out of homelessness, with many of its 133 units designed with two or three bedrooms, and a secure playground and courtyard centered under the shade of a large heritage tree. Congratulations to all the members of the project team and to our wonderful Walsh and RDF crews for your hard work and dedication: Tommy Koviak, lead WRB crew; Jeromy Wood, lead RDF Steel crew; Justin Nieto and Carlos Olivan, lead RDF Concrete Crew; Labor Foremen Vinny Ada and Jessie Sheriff; Mike Leslie, Skin Doctor; Superintendent Joe Grim; Assistant Supts. 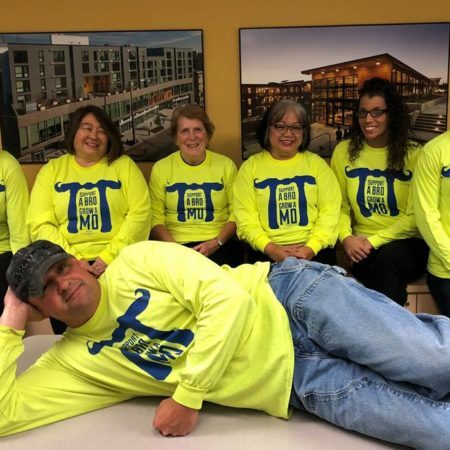 Peter Zastko and Josh McMillan; PM Marie Delano, Project Administrators Heather Correa and Marwa Zahid; Sr PMs Greg Linnell and Jack Kuester; Quality Manager Sharon Libby, and many others who deserve the credit for a job well done. Great job Everyone! The renovation of The Commons provides Security Properties Residential an opportunity to preserve the long-term affordability of the building while servicing the senior community for years to come and considerably improve the property as well as the community as a whole. Excellent work by LRS Architects and our WALSH team of Matt Leeding, Kim Smith, Richard Stephenson and Chris Wilen! Photo courtesy of Tom Emerson Photography! Sport a Mo, Save a Bro! Sport a Mo, Save a Bro! WALSH supports Movember, an annual event involving the growing of facial hair and moustaches during the month of November to raise awareness of men’s health issues, such as prostate cancer, testicular cancer, and men’s suicide. 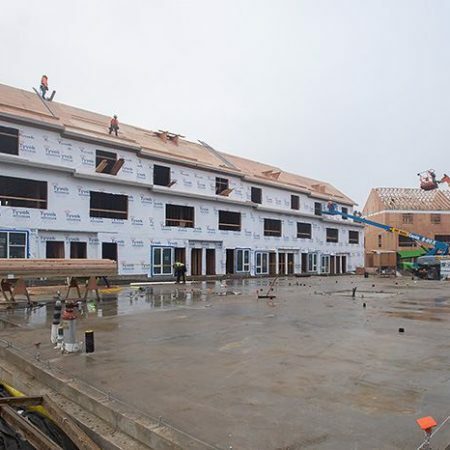 The Campus Redevelopment for Northwest Housing Alternatives (NHA) is Progressing Beautifully! 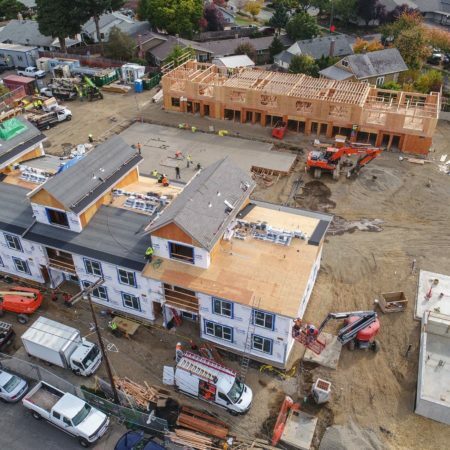 The campus redevelopment for Northwest Housing Alternatives is progressing beautifully under the thoughtful care of our WALSH project team of Aaron Elliott, Drew Anderson, Afton Walsh, Sara Schubert and Nick Cardoza. 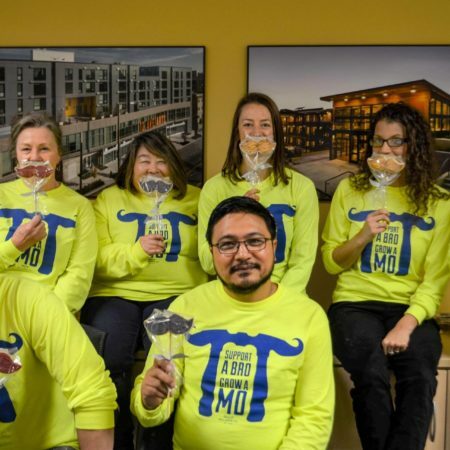 A huge thanks to MWA Architects for their clear communication and teamwork and a special shout-out to Wood Mechanix for their dedicated efforts! 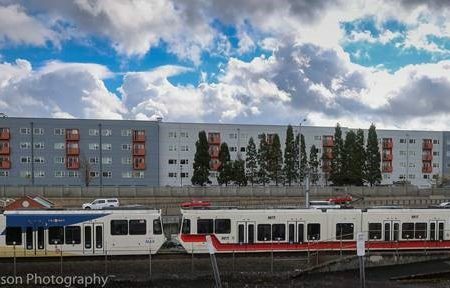 NHA’s new campus will include; 28 units of new, permanent, affordable housing; 60% expansion of the new Annie Ross House emergency family shelter and an Operations Center to guide services for over 2,800 people each year!